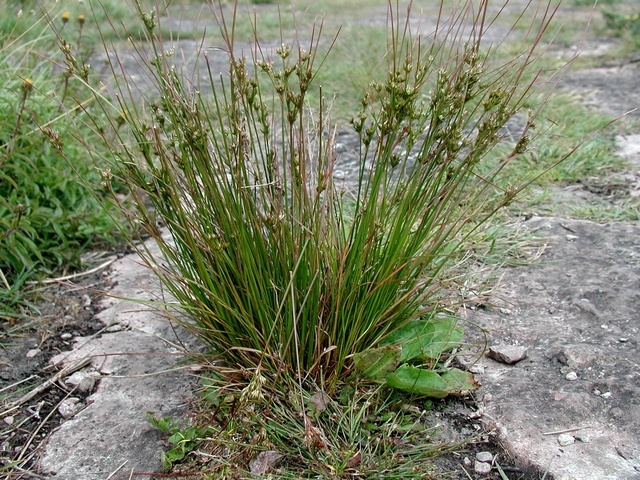 Juncus tenuis is a perennial, C3 rush (Basinger 2002), tufted, 10-80 cm tall (mostly less than about 30 cm), stems wiry, slender. Leaves to 10-30 cm long, 0.1 cm wide, flat or becoming in-rolled, all basal or nearly basal, sheath margins membranous, the top lobed. 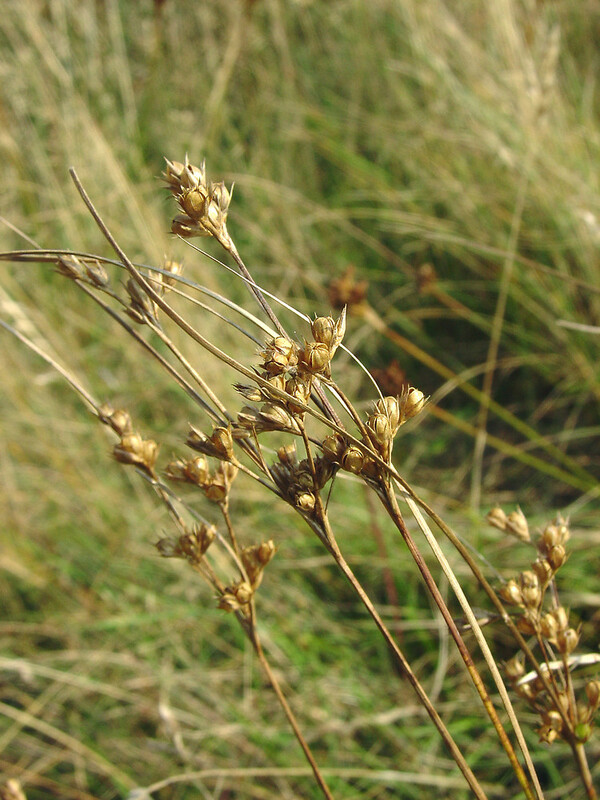 Flowers radially symmetrical, sepals and petals to 0.5 cm, longer than fruit, inflorescence loose, branched, bracts linear 1-10 cm, often longer than inflorescence; June-Aug.
Juncus tenuis. Flowers and fruits- By Glen Mittelhauser. Copyright © 2016 Glen Mittelhauser.New England Wild Flower Society.gobotany.newenglandwild.org (Accessed 1/2016). Fruit greenish to tan, usually shiny, to 0.4 cm, rounded on top, interior partitions not meeting in the center (use lens), July-Oct.
Habitat: Open areas or part-shade, soil pH 4.5-7, tolerant of fire, moderately tolerant of shade, intolerant of salt, drought (USDA, NRCS 2010). Notes: Tolerates dry, compacted soil and moderate trampling, often the only plant growing along paths, sometimes in wet meadows.